4 Charts: Jewish smoke & mirrors: Debt Vs Wealth: NYSE: 9 years of rises without any crashes? [I was taking a look at the stock market – the New York Stock Exchange. The market has been climbing insanely. Recently when looking more closely at the the way money is created in the USA by the Jew controlled Fed, it becomes clear that all of modern Western banking is based on DEBT. This is very different to the way Hitler and the NAZIS worked. It became clear to me that the ONLY way this system functions is on debt and only debt and always MORE DEBT. There can NEVER be a time when the USA, for example, can have no debt. This is simply not possible in this system. The Fed’s owners walk away with anything from $100 billion – $200+ billion in profits each year. Since they are getting this money for doing absolutely nothing, they can always adjust it up or down as much as they need to in order not to collapse the USA itself. 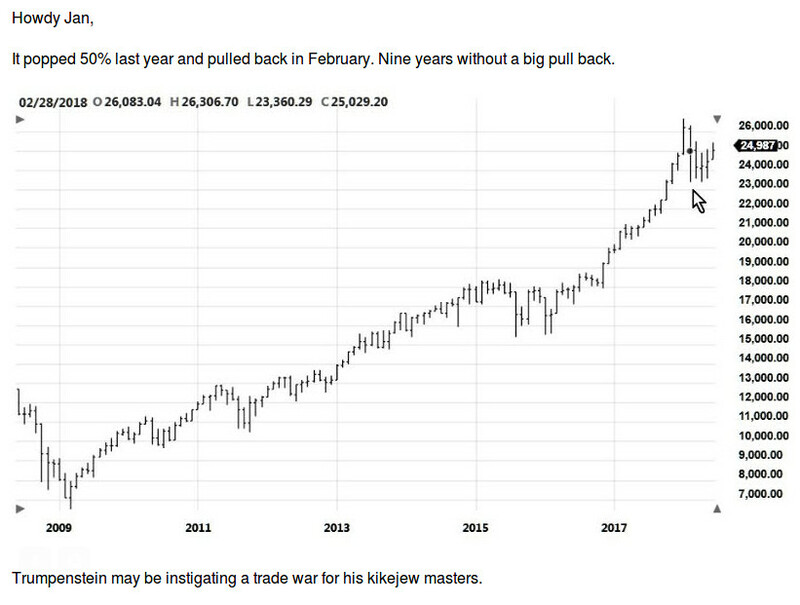 This bull market has been running for long. And its value has increased almost 3 fold in 9 years. But now that I understand that at the end of the day its all a mirage based on debt, it really is quite meaningless. But whites everywhere are fooled by this fake Jewish-inspired “success”. This is not real success. This is just a smoke and mirrors game. I popped an email to Bob in the USA who trades on the markets and used to work on Wall Street for good money when he was younger. He sent me this chart back with his comments. The global system, under the control of Jewish-America, really is all about the world being a big shop – just as Hitler predicted. A big crash could come, or some more years of “wealth and prosperity” could come, depending on what the Jewish smoke-and-mirrors people decides is best for them. I used to take these markets seriously and I used to believe in supply-and-demand, and I used to believe that things could “break”. But nowadays I see that all of this is nonsense. It is whatever the “(((international money power)))” decides it will be. 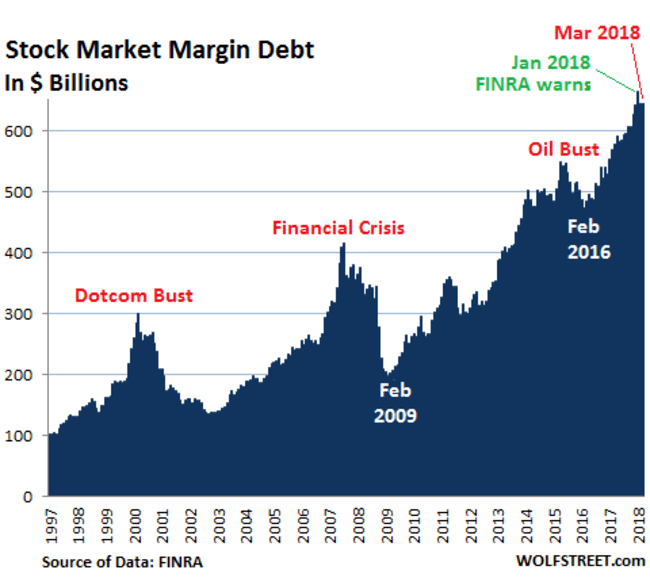 Look at the chart above and you’ll see how the Stock market margin Debt has shot through the roof just as “the wealth” in the chart below has “increased”. It means the speculators are speculating more! The other very important chart is the one below about the Debt Ceiling. That’s the critical one. “Wealth” and “debt” are really the same thing. But the debt is real and the wealth is not so real! There is no wealth. It just depends on how much money the Jews can manage to create along with their cuckolds and weaklings. None of this is real, and none of it should matter to the white race. What we need is real civilisational/racial progress, and not a Jewish money shop! Oh and another point! Don’t forget the greatest crash in history which was on the brink of bringing down the entire global banking system, occurred in 2008! Then, the US Govt’s cuckolds used private tax monies to pay the rich scum $700 billion to stop them from failing (as they rightly deserved to), because they were “too big to fail”. I bet you that $700 billion helped to fuel the resulting wild stock market run! So look at the top chart to see the amount of margin debt at the time of the 2008 crisis. Then look at how the debt shot through the roof after the bailout! 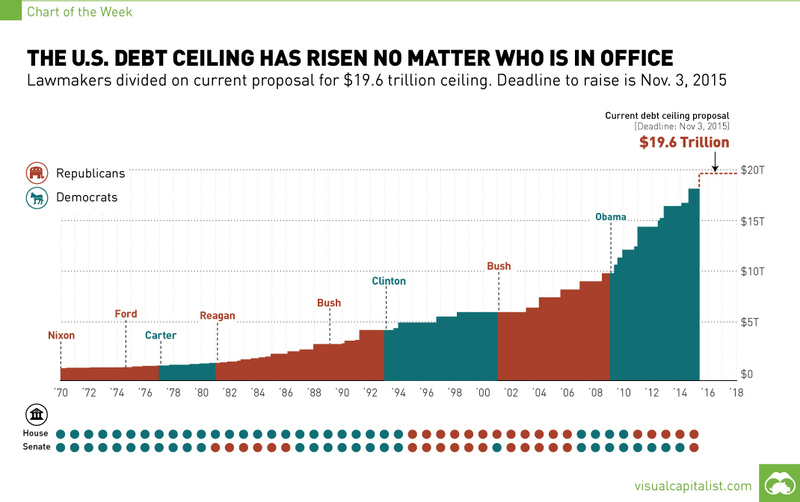 Look at the Debt Ceiling chart below. Anyone who believes that the debt can “go away” knows nothing about the system. You CANNOT get rid of the debt. The debt is the most critical part of the system. It is the debt which “drives the engine”. So normal white people think: When will the debt stop? When will they pay it off and “balance the books”? And the answer is: NEVER! The debt is the thing which drives everything and the debt will just get worse! Every President and every political party that gets into power only has one option: INCREASE THE DEBT! Then when they increase the debt then magically there is “wealth”. But the debt doesn’t go down!! It can’t! Look at how the stock market “rose” after 2009 under Obama! How cool! “Wealth!” Well, look at how much debt Obama created! Then you can see where the “wealth” apparently came from!! How ridiculous! The debt is enormous, but a tiny bit of it turns into “wealth” and everyone gets excited! At the bottom is a chart of all the US Bull and Bear markets from 1903 to 2016. It shows the % fall. You also can see the longest and shortest bull markets. The longest having run for almost 15 years. ← Why is this lying Jew saying this? Israeli lawmaker proclaims supremacy of Jewish race! Launch of White Man Music!